You like to impress your girl and willing to put a smile on her face every day. What do you need to do? What to say to a girl and impress her? There are some cute things to say to your girlfriend. It may be your own or You can steal it from us. These are all simple yet effective convo texts to use day to day. Just a simple smile emoji with a heart is enough to make your girl go crazy for you. All she needs to know is that you are there for her and you are thinking about her. 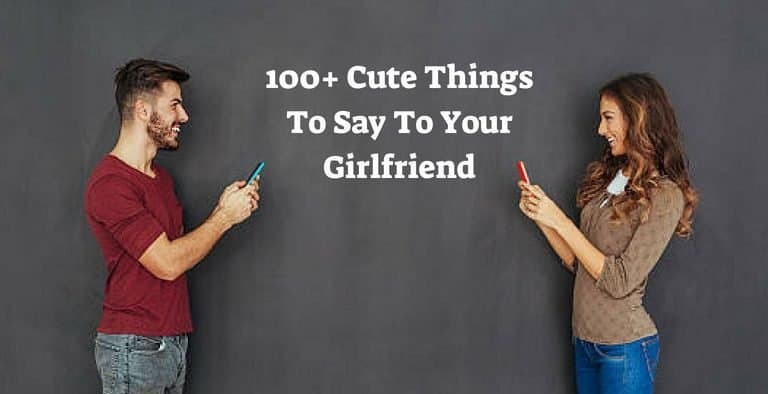 Assure her that through sending cute messages, nice texts about her or about the things you are doing through WhatsApp or mail whenever possible. We have given few nice, cheerful and sweet things to say to your girlfriend. 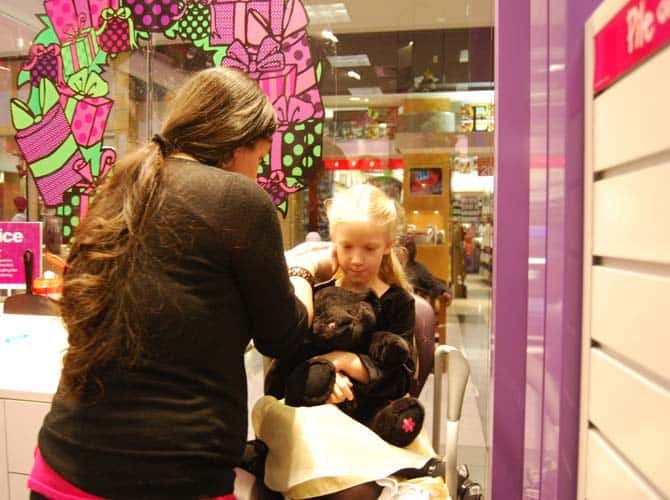 We are sure that you will like it and can relate to your situations very well. It will put a smile on her and even to you while reading. Spend some time to read it. Enjoy! 1. I was playing my video games and just realized that you and I are like Xbox & Controls. We need each other so badly. 2. Look into your watch and tell me what it says? Girl Friend: It says the time. No. It says, ”We’re already so late and we should go on a romantic date right now”. 3. I like to watch the sunrise from my window for the rest of my life with you. What do you say?. 4. You are so into me. Even if I want, I can’t get you out of me. 5. I knew the moment I saw you that my life’s going to be a topsy-turvy Love ride. 6. Give me a kiss. I just want to forget the entire universe and my existence. 7. You have not even the slightest idea of how crazy I am about you. Crazy enough to see your face when I look at myself in the mirror. 8. Of all the women in the world, why did I love you? Well, the answer is obvious. You’re not just any women; you are THE WOMAN for me. 9. Every time I look into your eyes I get butterflies. 10. Our love story should make our kids go breathless when they hear it. 11. 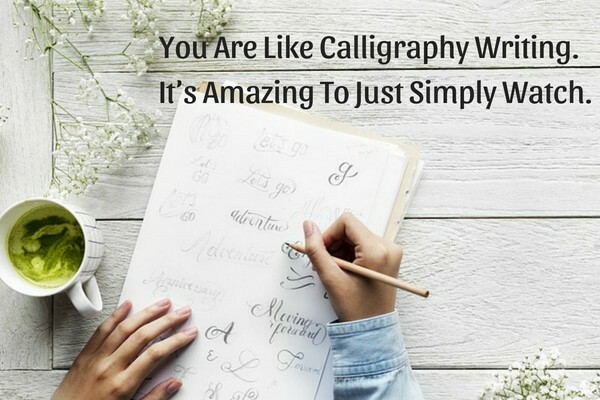 You are like calligraphy writing. It’s amazing to just simply watch. It’s one of such cute and nice things to say to a girl in a casual way. Just send this text to her. 12. I feel like I can’t have a future past you. 13. You and your love are like Music and Lyrics in a song to me. 14. I can just eat anything without sugar and sweetness when you are near me. You are the entire sweetness I need. 15. You are my GALWAY GIRL. I am lucky than Ed Sheeran’s. 16. Be my girlfriend. We have our entire life to figure out things between us! 17. I couldn’t find any words to put together to speak when I am near you. You just shut my entire vocabulary with your blink. 18. I can binge watch our photos together my whole life. It can never tire me. 19. Leave your love and smile with everything in my home. I don’t want to miss you when you’re gone. 20. I have a list. Boyfriend, Best friend, Lover, Husband, Dad to your Kids. I like to start from the top of the list with you. But I don’t mind going in any order. 21. 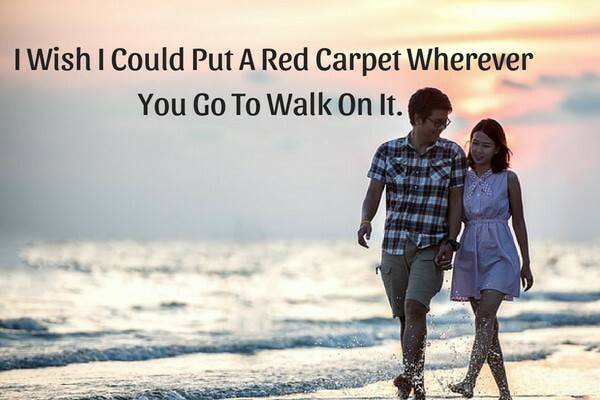 I wish I could put a Red Carpet wherever you go to walk on it. It’s one of the romantic things to say to your girlfriend. 22. Please don’t come out. You make the nature blush. 23. I want to catch all your smiles and laughs without spilling it. That’s my agenda today. 24. If I get a wish, I want to wake Byron from his eternal sleep to write the best love poem for you. 25. My heart did not ask me to go after you. It just did. It’s such a sweet things to say to a girl. 26. If you want, I can hold the moon entire night in my palms near you instead of a bedside lamp. 27. It’s sunshine because you opened your eyes in the morning. If its dewdrops, then you must have washed your face. 28. The memories we had become my breath. 29. I have never liked an angry face except yours. ( Such a cute quote! ). 30. You didn’t knock me before entering my heart. That’s the whole point. Love doesn’t knock. You just happened. 31. 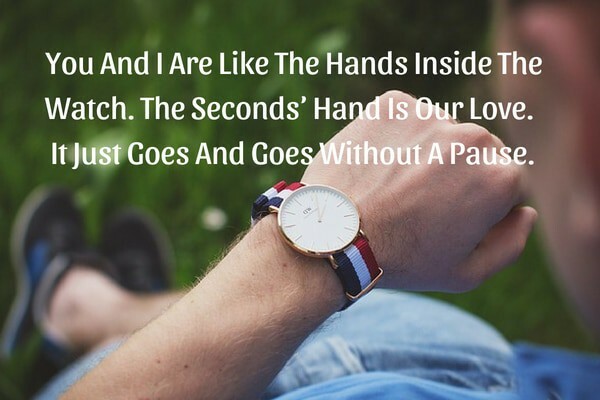 You and I are like the hands inside the watch. The seconds’ hand is our love. It just goes and goes without a pause. It’s one of the cute things to say to your girlfriend. Say this to her and win her heart. 32. I am like a candle. You’re like a love spark. I just melt instantly when you’re near me. 33. Your love cuts me deeper than a sword. 34. As Kids are to candies, so am I to you. 35. I like us to be the best Boyfriend and Girlfriend even after having our grandkids. 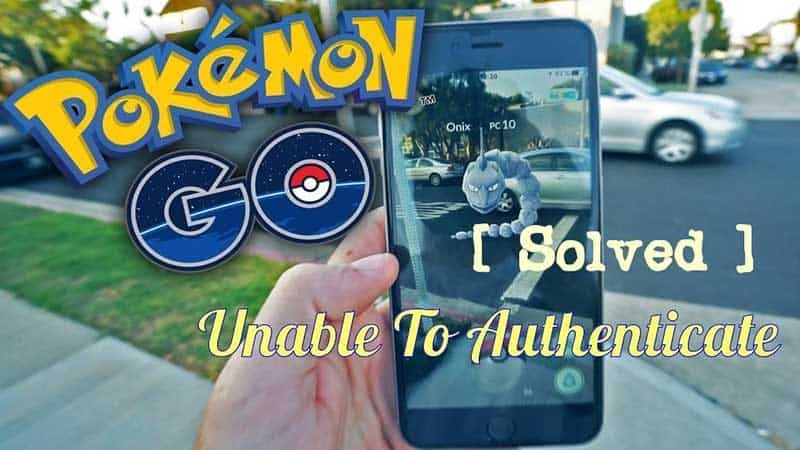 What do you say about this idea? 36. In Love Cricket, I am your Wicket. My wicket just fell the very instant I saw you first. 37. Even in the crowd I can exactly catch your breath. 38. I could see beyond your face and I found the next most beautiful thing, your heart. 39. You speak to me and all I can feel is a lullaby. 40. I need a kiss on my forehead and share my morning coffee as the first thing in the morning from you. 41. Your kiss has the power to alter my DNA. 42. I keep scribbling our name together in whatever paper form I can get hold of. 43. If I could put it simply, I want to fall in love with you every second till nature’s alive. 44. I have never Google’d anything romantic. I have never searched for love messages, cute things to say to a girl, gifting or anything related to love, until I started seeing you. Now, I became so crazy that I just Google everything, even a romantic good morning message just to impress you. 45. I want you to be the Leading Lady in my Movie. It’s going to be the best ever made movie on Love. 46. You happened to me as a surprise package from god wrapped with love, warmth, kindness and joy. 47. Be my Ellie so I could love you ten folds more than Carl. 48. I like you for no reason. And that’s the reason I want you. 49. Let’s tango. The stage of our life is all set. 50. The moon wants to come out, but too shy to come before you. So please close your eyes. 51. 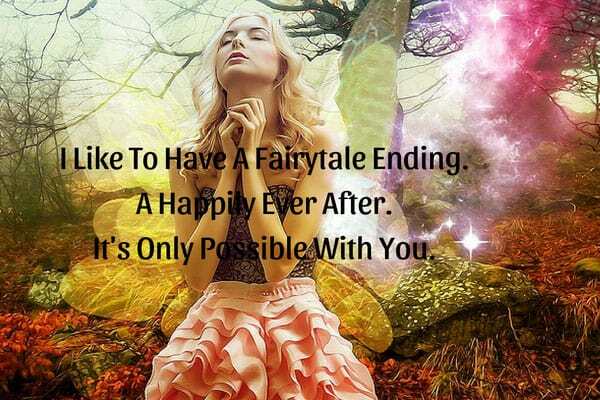 I like to have a fairytale ending, A Happily Ever After. It’s only possible with you. 52. You and I are like book lovers and bookmarks, such a Crazy bonding. 53. Can you give me the honor of having my name next to yours? 54. I wish I could study together with you at Hogwarts because you’re so magical. 55. You give me the same vibe as that of every day I enter my favorite café. Full of freshness and warmth. I really like it. 56. Do you know what I thought when I first met you? Its ‘& So The Adventure Begins’. 57. Since I am a huge LOTR’s fan, let me put it my way. You are to me like Lord of The Rings to JRR Tolkien. His Masterpiece and Crown Jewel. 58. You give me a sweet adrenalin rush, in no matter of time. Just your blink triggers it. 59. Every time I’m about to see you I get this ‘fast-paced, edge-of-the-seat, spy thriller’ vibe. I like it. 60. What is your favorite ice-cream? All right! I like to buy it for you for the rest of your life. 61. 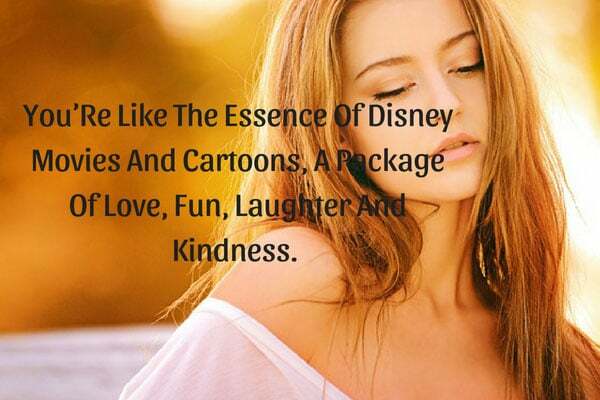 You’re like the essence of Disney movies and Cartoons, a package of Love, Fun, Laughter, and kindness. One of those cute things to say to your girlfriend! 62. The goodness your heart holds just swept me off my feet. 63. I want you to take a paper and write down things about how you’re boyfriend should be even after becoming dad to your kids. I like to prepare myself. 64. You are the music to my LA LA LAND. 66. Without you I am just a ‘Wreck It Ralph’. 67. I have another ticket to eternity, will you come with me? You can’t find any other sweet things to say to a girlfriend than this. 68. I couldn’t help but get the feeling that you are going to be my better-half. 69. I may be a thief, but you’re the one who is stealing my heart. 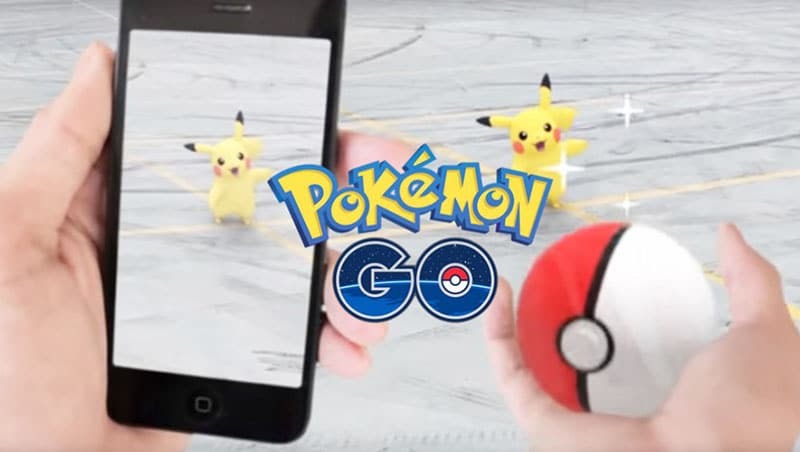 70. I like to watch every romantic movie ever made with you, pretending that we are the leads in the movie. 71. 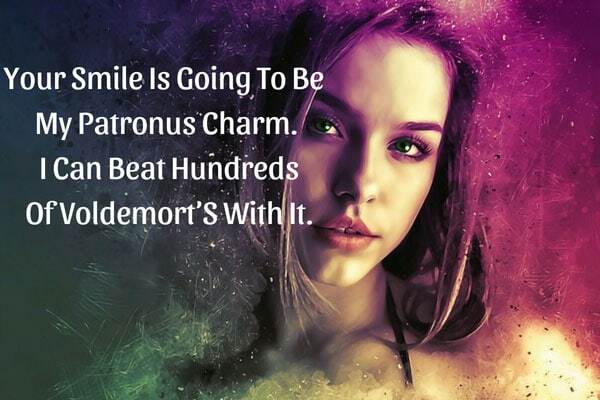 Your smile is going to be my Patronus Charm. I can beat hundreds of Voldemort’s with it. If you are a Harry Potter’s fan and searching the sweet things to say to your girlfriend, pick this one. 72. My Instagram page just collapsed with too much beauty overload. It’s because I uploaded all the pictures I had where you smile. 73. If I could get to be ‘Twitter’ for a day or at-least an hour, every tweet, re-tweet, favorite, trending that’s posted will be your name and your favorite things. You’re going to just blush all day and I will be there to admire it. 74. In Game of Thrones, I am King’s Landing and you’re The Iron Throne. The King’s Landing is where the Iron Throne is. 75. If I’m the perfume, you’re my notes. Be it, the Top-notes, heart-notes, basic, just everything. You add the total meaning to me and I am nothing without you. 76. You are my celebration in everything. 78. I wish I could literally etch your name on everything nature has to offer. Be it, the sky, the stars, the moon, the mountains, the water or whatever. It is so that I could never get the feeling of missing even your name. 79. I want you to be a part of my ‘everything’. My good, my bad, my success, my downs, my pain, my humor, my love, my life, just everything you can think off. I don’t want to do this alone. I need you. I can’t imagine anyone but you. 81. 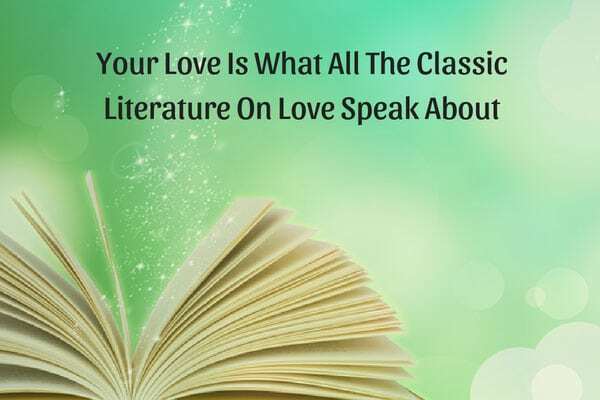 Your Love is what all the classic literature on love speak about. Yet another Sweet things to say to your girlfriend. 82. Be my Jane, & Forever I want to be your Tarzan. 84. We push and pull like magnets do. (as in ed Sheeran song J). 85. Long live to the Spark of Love in your eyes. I am totally down for it. 86. I wished for flowers but God gave me a wonderful garden to me. It’s you my love. 87. I don’t know what to say to you exactly on our date, but the point is BE MINE. 88. I like to have my number on the first of Speed Dial and first on the Call Log of your phone. 89. Flirt with me, Fight with Me, Share with Me, Love Me, Hate Me, Marry Me. In simple, be with me in wear and tears of my life. 90. You make my nerves go chill every time you sit next to me. Just Every single time. 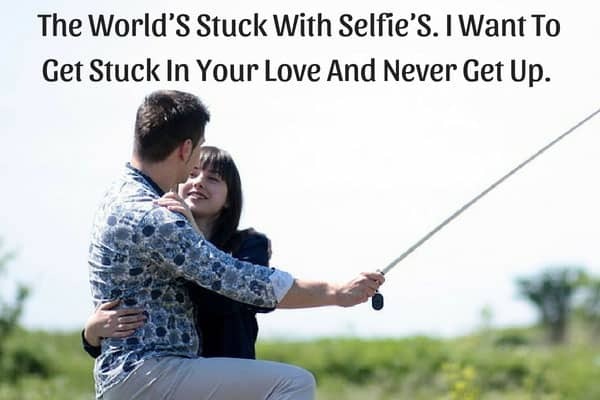 91.The world’s stuck with selfie’s. I want to get stuck in your love and never get up. 92. In my rain, your umbrella is the beauty. 93. All of a sudden, my mind & heart is searching for words to speak and then I realized that you’re standing in-front of me. 94. I am getting defeated by you, your strong deep love. I never want to win the battle. 95. You are the sound that knocks my Heart. 96. There’s a thunderstorm, did you just blink your eye? 97. I don’t know how I got this idea but I’m starting to plant my gardens fully with roses of all colors. It’s after you said you like to see roses daily in the morning. 98. I like to make your favorite breakfast, coffee and waffles every morning, I meant every single mornings for the rest of my life. 99. I feel like I am totally surrendered for you. I don’t want to find any way to come out. I think it’s good that way. 100. You just altered my Mind, Body and Soul just like that with your love. Now, I can’t see anything past you. 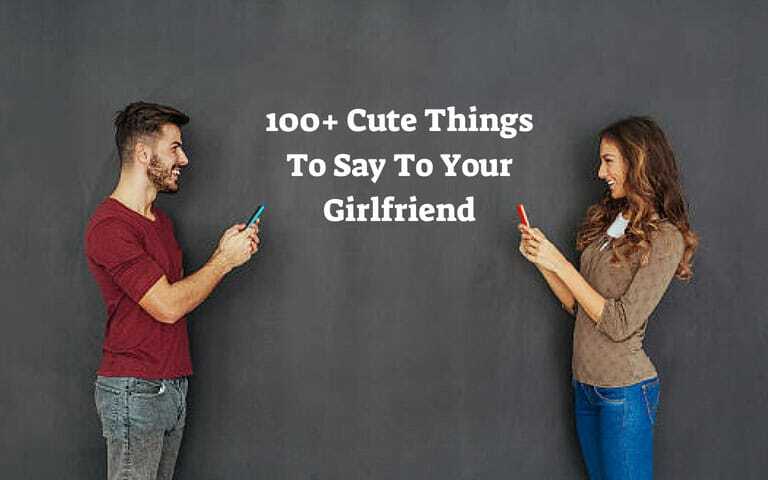 So, that’s all about the nice and cute things to say to your girlfriend from our side. Take it as a template and let your imagination be float around. Send it to her every day and whenever it’s possible. Just throw it like confetti. Flood her inbox with your words. Say to her that she is always in your thoughts by a simple text. It just makes her go head-over-heels about you. So go ahead, Try to win your girl every day and she will be yours forever.